Featuring such iconic names as Neil Gaiman (Sandman), Alan Moore (Watchmen, V for Vendetta), Grant Morrison (Batman: Arkham Asylum) and Posy Simmonds (Tamara Drewe), this exhibition traces the British comics tradition back through classic 1970s titles including 2000AD, Action and Misty to 19th-century illustrated reports of Jack the Ripper and beyond. Comics Unmasked is the UK’s largest ever exhibition of mainstream and underground comics, showcasing works that uncompromisingly address politics, gender, violence, sexuality and altered states. It explores the full anarchic range of the medium with works that challenge categorisation, preconceptions and the status quo, alongside original scripts, preparatory sketches and final artwork that demystify the creative process. Enter the subversive and revelatory world of comics, from the earliest pioneers to today’s digital innovators; show runs to August 19, 2014. That’s not all – we request that you come dressed up as your favourite character, watch not one but two tumbling hedgehogs, take tea (well maybe…) with a dormouse, and meet a flamingo – yes really, meet a flamingo! 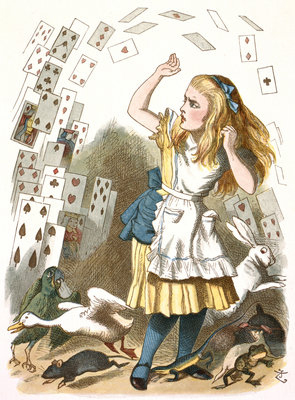 Most important of all, see for yourself where it all started: ‘Alice’s Adventures Under Ground’ by Lewis Carroll is perhaps the most famous of all the British Library’s 19th-century literary manuscripts. It is Lewis Carroll’s first version of the work later published as Alice’s Adventures in Wonderland (1865), and it’s on display for you to see! !